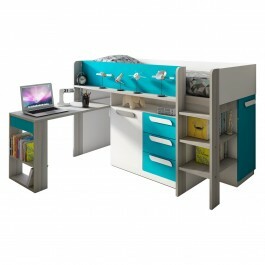 NESTED SPACE-SAVING STYLE: In just 96.5” x 42.1” of floor space, this bunk bed set combines 2 twin beds, a desk with shelf, a bookcase and underbed storage, with lower bunk and desk nested under the top bunk, and easily pulled forward for use. 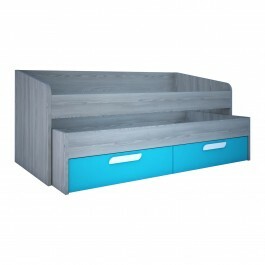 3-TONE COLOR: This set is made in White with dark Molina Oak woodgrain and black Graphit or electric Blue accents, creating a neutral background for changing color schemes and themes as your child grows. 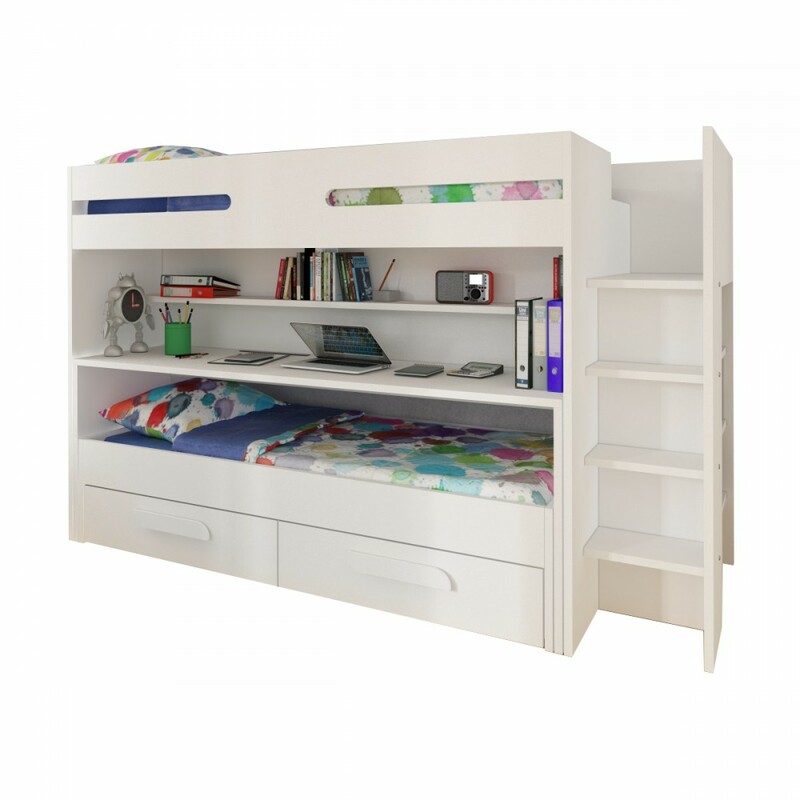 SAFE FOR KIDS: Features like a full upper bunk guardrail panel and built in steps to the top bunk make this a bunk bed set that’s safe for kids to enjoy. 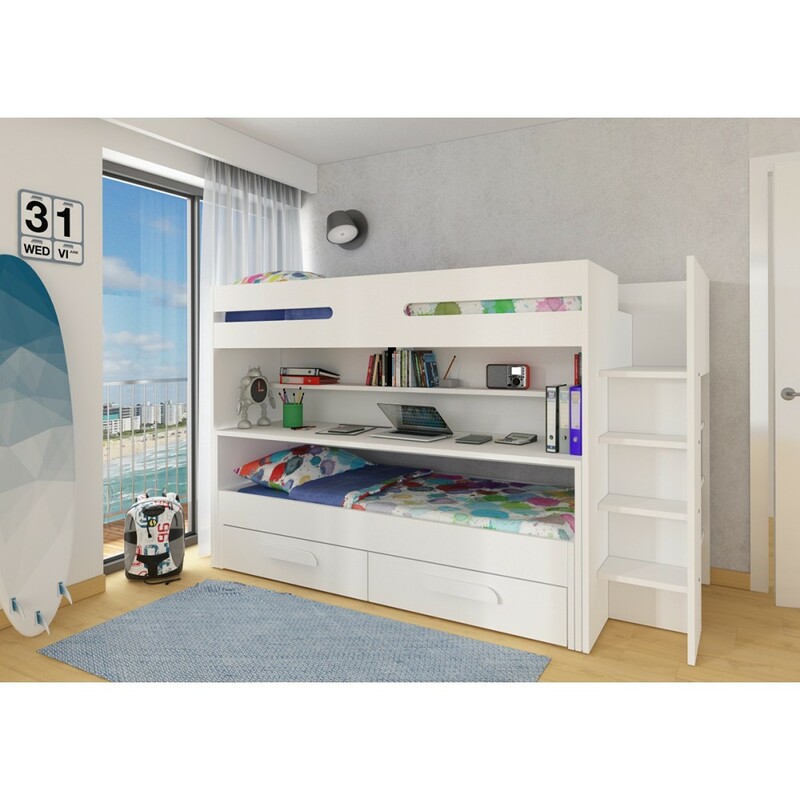 BUILT TO LAST: Made from top-quality MDF boards and heavy-duty steel hardware, this bunk bed set will stay sturdy and strong, with durable veneer finishes that resists scratches, stains, and fading from UV rays. 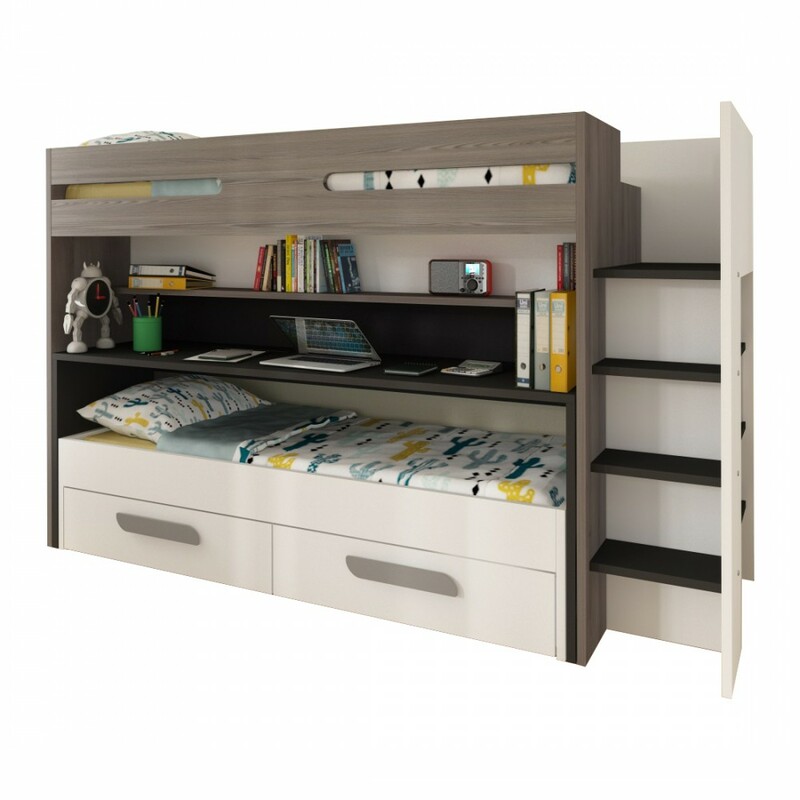 MAXIMIZED STORAGE: A 3-shelf bookcase at the end of the bed, as well as a shelf over the desktop, provides a space for books, photos, toys, and collectibles, with 2 deep underbed storage drawers for clothing, games, shoes and more. 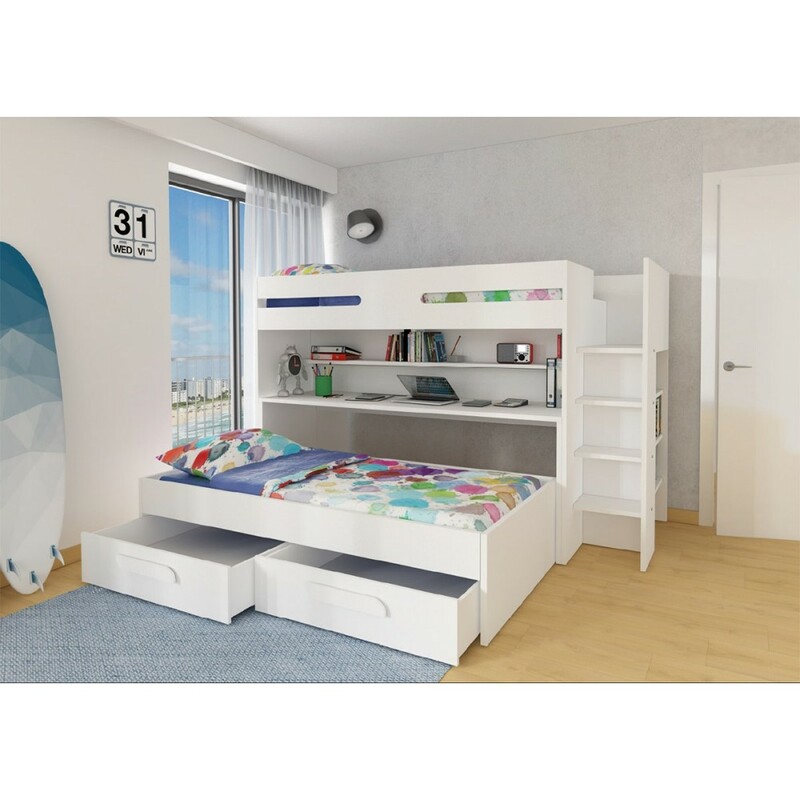 Clever design, maximized storage and top-grade construction make this twin bunk bed set the perfect choice for kids of all ages! The nested, space-saving design provides space for two twin beds, a desk with shelf, two storage drawers, and a bookcase, all within the floor space of one twin bed. 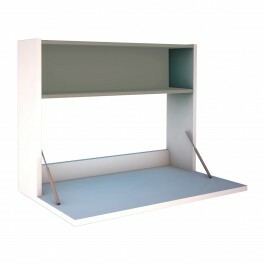 The lower bunk and the desk are built on casters, able to be easily pulled out when needed. The set is designed in a 3-tone color palette, in White with rich Molina Oak and dark Graphit accents, a neutral palette that works for boys and girls, and can be combined with the ever-changing color schemes and bedroom themes of a growing child. 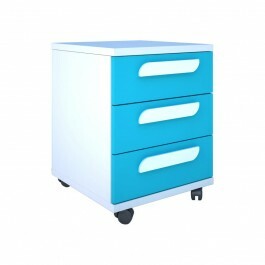 It is built from top-grade MDF boards, and is put together with heavy-duty steel hardware, ensuring it will be sturdy and long-lasting, with durable veneer finishes that retain their luster while resisting scratches, stains and fading. Add safety features like a full guardrail panel on the top bunk and built-in stairs, and you can see that this set will be a wonderful addition to your home. ULTRA-MODERN STYLE: Sleek lines and on-trend color palette provide a furniture style that blends wi..